Large flat-screen TVs Sweet Sleeper beds and a downtown Brooklyn location a block from the subway to Manhattan make the Sheraton Brooklyn New York Hotel. The 25-floor Sheraton Brooklyn offers 321 traditional rooms and suites with contemporary design relaxed living spaces 42-inch flat-screen TVs fine linens and down-filled pillows on cushy Sheraton Sweet Sleeper Beds. Rooms have Wi-Fi for a fee. Non-smoking rooms are available. The hotel has a fitness center restaurant and bar. Valet fee-parking is available. 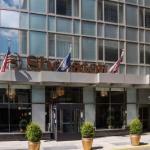 A block from midtown Manhattan by subway the Sheraton is in downtown Brooklyn. LaGuardia Airport is a 20-minute drive JFK is 30 minutes and Newark Airport is a 30-minute drive away depending on traffic. Nearby attractions include the Brooklyn Bridge Prospect Park and the seasonal New York Water Taxi.